Image available within an hour of the accident. On May 3rd 2018 a Russian Air Force Su-30 jet crashed shortly after take-off for unknown reasons. Initial rumours suggested a bird strike on take-off, and with a full load, a loss of an engine would have been catastrophic. So where did it crash, exactly? Let me introduce you to satellite imagery that isn't quite as crystal clear as the 30 cm resolution imagery you're used to on Google Maps. 3 meter resolution imagery is updated much more frequently, allowing the kind of coverage you simply couldn't find commercially in the past. Enter Planet Labs, and here is their image from 2018-05-03 at 10:47am local time. The crash is reported to have happened within a half hour previous to the picture. 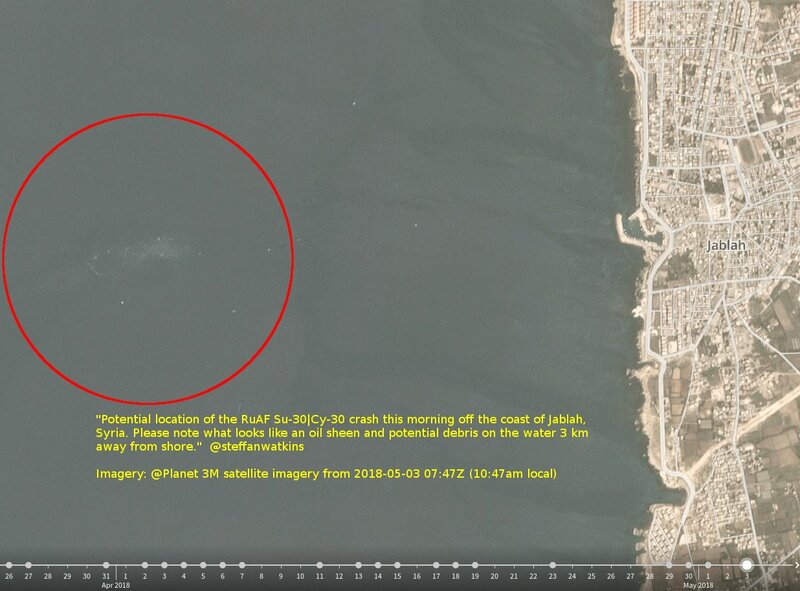 In the image we see what looks to be small boats, a small oil sheen, and possibly debris ~3 km from shore. 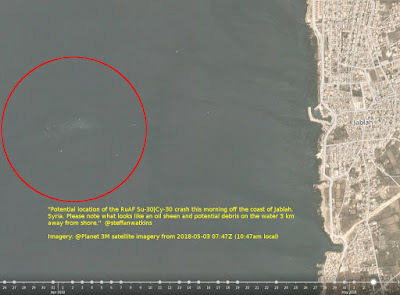 I'm not getting into the geopolitical aspects of the Syrian war, if the Russian air force should be there, or commenting on the loss of the two Russian pilots (which is a tragedy regardless of who's side you're on); I'm just using this as an example of how readily available satellite imagery can spot a crash site and give you information about something very quickly after such an event, before the news media has caught up on the story, or even officials are aware of what's going on. Never before have the public been able to short-circuit the dissemination of information to this extent, and bypass traditional media. I don't mean that journalism is dead, I think journalists are able to take a step back and do the deeper dive, and get more information to publish the "whole" story, while people get their fix for immediate news from primary sources like never before.